Deciding what to do about the explosive growth of mobile traffic can be difficult. That’s why we’re bringing you some of our picks for the best of the mobile web, with mobile-optimized sites that bring a unique and useful experience for users. Some of these sites are from large retailers, but the sites exhibit features and design structures that could be emulated by smaller merchants. So, before you go off and design your own mobile site, have a look at some good examples of what is already out there. Note that we’ve provided mobile screen captures, below, for the examples we cite. You can also load the examples into your own mobile Internet device, of course, or absent that you can use a mobile simulator in a traditional browser, such as Opera’s Mini Simulator, Test iPhone, iPhoney for iPhones, and dotMobi. Zillow home page on mobile-optimized site. Zillow’s mobile site does one thing really well: looking up property values. It’s not flashy, and it has a simple interface on the home page, as mobile sites should. However, Zillow has found a way to embed a graph of the property value over time and a Google map onto the results page. Users can see this when they type an address for anywhere in the U.S. The images load quickly and make for an appealing layout. 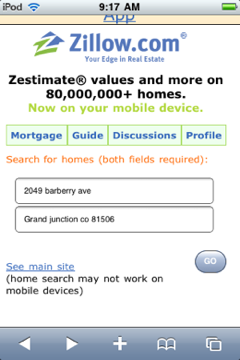 The main problem with the mobile-optimized version of Zillow.com is that the “Zestimate” property value search is the only function that works on the mobile device. The rest of the links send the users to the main site, which loads really slow and requires tedious navigation. It would be better not to have multiple links to the main site, just the one at the bottom. In other words, do not use the main menu to highlight mobile features that are not available. Nordstrom home page on mobile-optimized site. 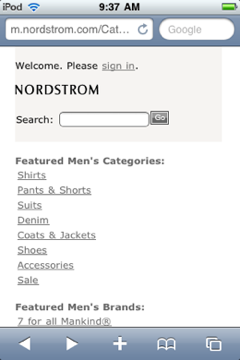 Nordstrom’s mobile site is an excellent example of a pure m-commerce site. The entire shopping experience takes place on the mobile web, and the site works so well on the device you’d think it was an app. There are many products available; though it is unlikely M.nordstrom.com contains the main site’s complete catalog. What I like most about this site is that the home page contains all the crucial information shoppers need, and nothing more. This includes a search function, product categories, sign-in, store locations, contact information, and a link to the main site. Each product page has a decent-sized photo, a complete description, size and color options and the possibility of ordering by phone. It is interesting how Nordstrom has dealt with the security issue in its mobile checkout. Its mobile site requires users to sign up for an account on the full site before they can use mobile checkout. Many users do not want to type in all their information on their mobile keypads. Requiring them to do so can often lead to mobile cart abandonment, which may be why Nordstrom sends them to the main site first. MizPee home page on mobile-optimized site. This is an example of a utility that becomes more useful the more it is used. MizPee is a mobile site that, according to its tagline, tells you where to go on the go. It allows you to input a street address in several major cities and search for the nearest listed public bathrooms. You can see a street map with the area marked and with toilets rated according to cleanliness and amenities. Currently, most cities have no information in MizPee; but because users can add their own public restrooms to the list, it will become more relevant the more people use it. An interesting feature is the location-based advertising results that show up on the page after a user has specified his or her location. The ads all have a proximity line, like “1.72 miles away.” Merchants with a brick-and-mortar store should consider the effects of location-based advertising like this. They should be on the lookout for mobile sites and apps that have this feature, and tap into customer traffic in their local area. Target home page on mobile-optimized site. Target strives to be a one-stop shop with a huge inventory. Small- to medium-size stores have different needs than this enormous retail juggernaut, but there are some mobile web lessons to be learned from Target’s mobile site. Merchants with large inventories who are unable to list all their products on their mobile site can consider Target’s way of featuring certain products based on category, user ranking and discounts. 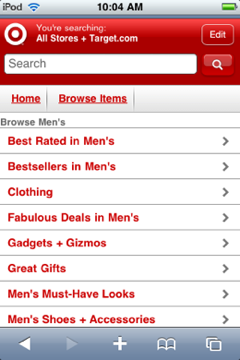 Target also goes beyond offering simple shopping options on its mobile site. Users can manage their gift registries, buy gift cards and look up store locations on their device. Target takes mobile shopping to the next level by allowing users to download and save gift cards to their phones so they can be used at checkout. By doing this, Target has gone beyond condensing its regular site into a mobile site by offering unique features that appeal exclusively to mobile users. These are just a few of the many different methods of mobile optimization. In the coming weeks, we will be presenting more of our favorite picks for best mobile websites and mobile apps.